Are you guys getting tired of pumpkin recipes yet? I hope not, because I have so many more to share with you! We all know I’m a morning person who isn’t a morning person. Anyone with me? I’m up by 6 or 6:30am every day but I’m not human until I’ve had my coffee. Even once the human in me has emerged, making breakfast is the last thing I want to do. As a result, we eat cereal most days…unless I think ahead. Or unless I have a super simple EASY recipe at my disposal. 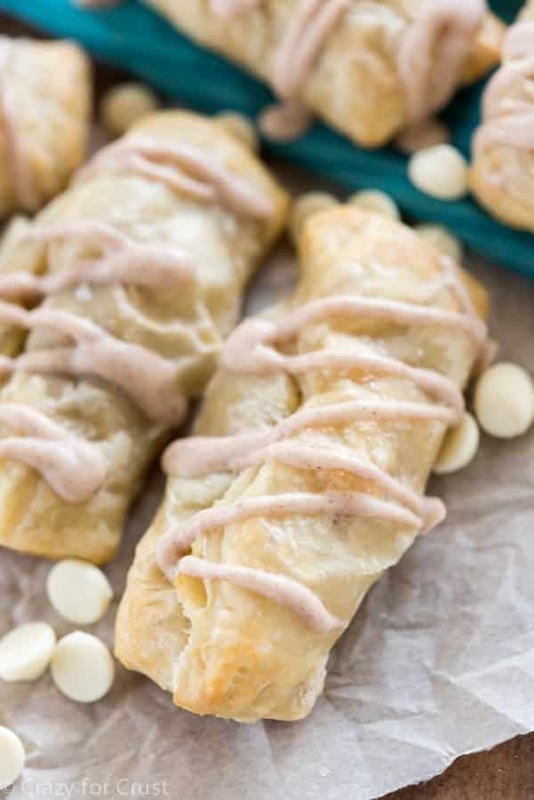 These Easy White Chocolate Pumpkin Croissants are the perfect breakfast recipe for those lazy days, especially this time of year! This recipe starts with puff pastry dough. It turns out like a flaky croissant, every time. And who has time to make croissants? NOT ME! The croissants are filled with a rich pumpkin mixture that’s sweet and pumpkin spicy and filled with white chocolate chips. It’s the perfect croissant for pumpkin season! And if that isn’t enough…I made a white chocolate cinnamon glaze for the top. Oh my gosh, just give me a straw with that glaze!! This recipe for Easy White Chocolate Pumpkin Croissants couldn't be more simple! Just a few ingredients makes the perfect fall breakfast! Preheat oven to 400°F. Line a cookie sheet with parchment paper or a silpat baking mat. Unwrap puff pastry sheet and cut into 9 squares. Stretch each square out just a little bit. Stir together pumpkin, sugar, and pumpkin pie spice. Place about 1/2 tablespoon of filling in the center of each puff pastry square. Sprinkle about 1 teaspoon of white chocolate chips on top of the pumpkin mixture. Roll the two sides up over the top, overlapping them. Pinch the ends with a fork to seal. Place croissants evenly on cookie sheet and bake for about 13-15 minutes. Cool before glazing. To make the glaze: melt 1/4 cup white chocolate chips with oil in a small bowl on 50% power in the microwave. Heat in 30 second increments, stirring between each, for about 1 minute total (depending on your microwave). Stir in cinnamon. Drizzle over croissants. (I placed my glaze in a ziploc sandwich bag and cut off one tip to drizzle.) Let set then serve. Best eaten the same day they are made. These croissants look so good! I have to agree with you, spending any more than 30 minutes in the kitchen early morning is an absolute no – no! I love the idea of making these fall – worthy treats! Heading over for the recipe! The links are going to a kitchen gadget page on Ebay. Am I just missing the recipe? Glad that this is your ‘lazy day’ breakfast…mine is…nothing! Or cereal 🙂 I am so not a morning person it’s not even funny. I am a night owl all the way! I love the pairing of white chocolate and pumpkin, too! Croissants look like so much fun to make. 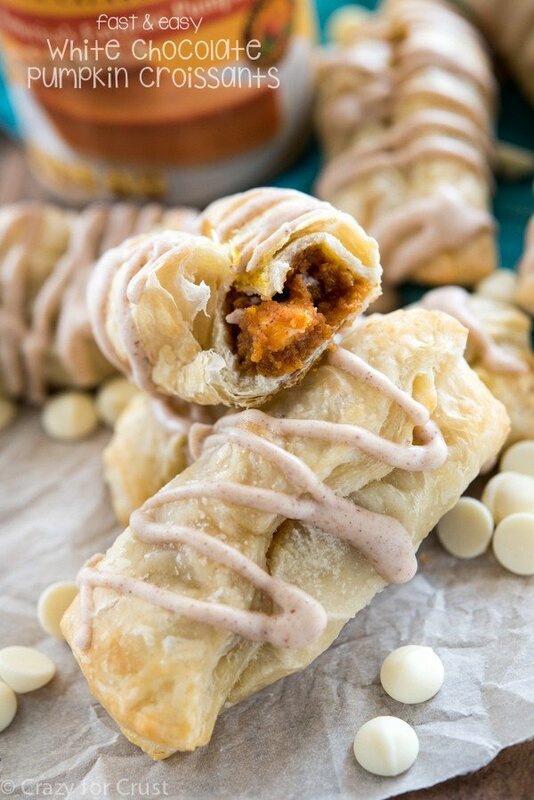 And these pumpkin ones sound heavenly! I love 6 AM. Can we still be friends? These look delicious! Not tired of pumpkin yet. Bring it on! If it’s not canned pumpkin, where do you get pureed pumpkin?